The Research Writing Tutor (RWT) is an automated writing evaluation program that analyzes drafts of academic research articles and generates higher-level, rhetorical and discipline-specific feedback for writers, aiming to help them develop strong scientific arguments and academically compelling texts as expected by their disciplinary community. The RWT promotes writer reflection and a stronger awareness of the rhetorical structure of a good argument. 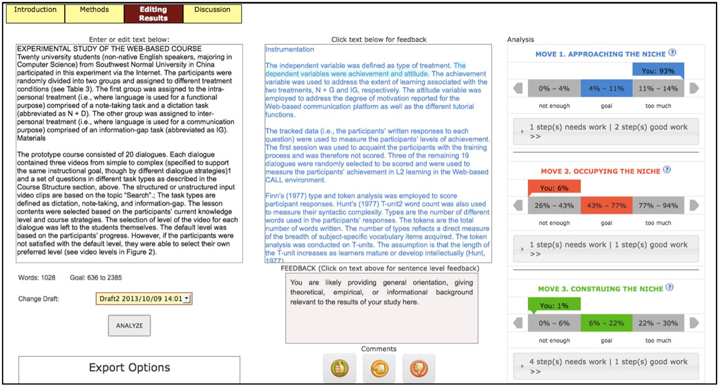 The RWT gives feedback using corpus-based machine-learning techniques. RWT has been used for several semesters at Iowa State within graduate writing seminars.